Apple Pie is my thing. 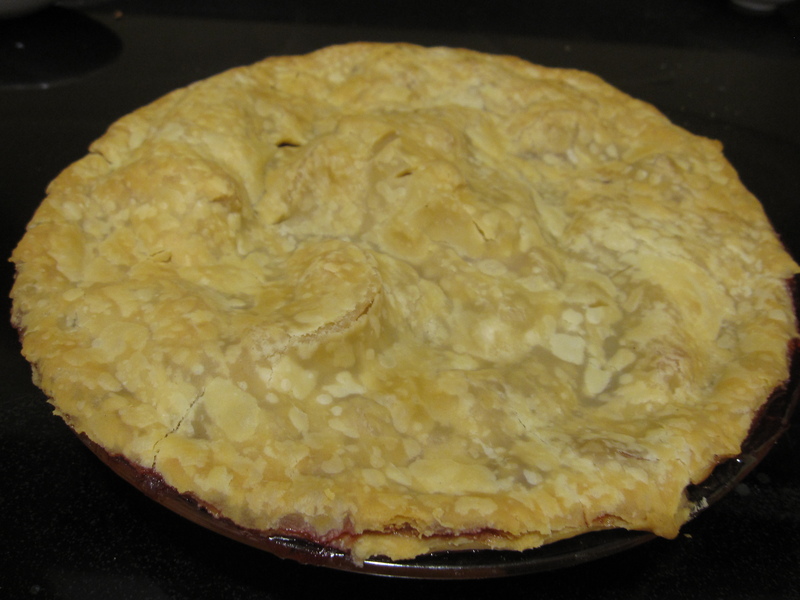 I won a pie contest at our local library when I was 5/6… no, really ask my Mom! I totally rocked it. Plus I used a Pillsbury crust which made all those grandmas pissed to no end since my pie with store bought crust kicked their pies bottoms with homemade crusts. Must dig that photo out somewhere. (Get on it Mom!) Well, since then I have to make apples pies in the fall. HAVE TO. I signed up for a Meetup event that was a mac and cheese/ pie cookoff so this required me stepping up my game and trying something new. I saw a recipe for an apple cranberry crumb pie in my new gourmet magazine that sounded good but since I hate crumb toppings I had to do things my way. 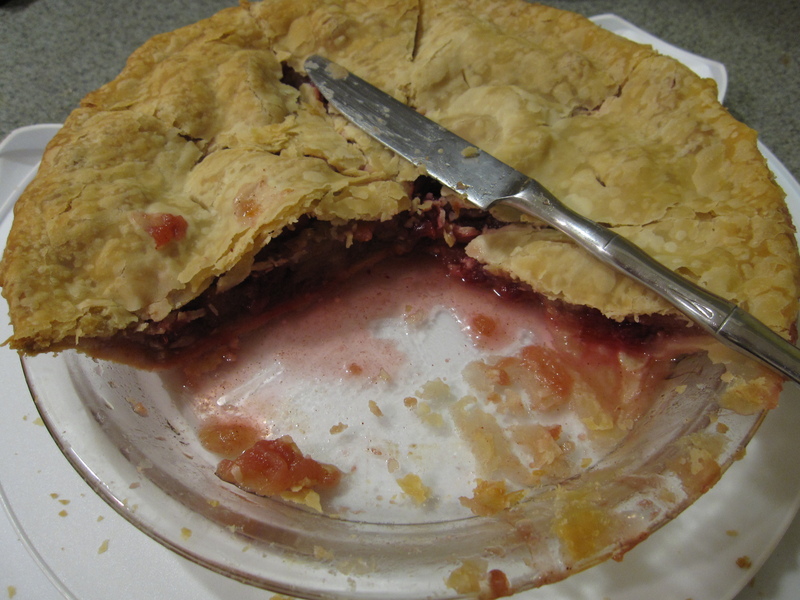 I was happy with the outcome of my pie since the sweet apple was balanced by the tart cranberry. Plus the cranberries still had a bit of that burst in your mouth consistency. I typically make pies that stack up really high but since I was pressed for time and space in my tiny ‘oven’ I made them average, I guess you could say that. While at the meetup people were saying how interesting and good mine tasted with the cranberries and something else, something they could not figure out. Well that something was ginger. I had an impulse to add some ground ginger and I guess it paid off. Although I used cornstarch, like usual, it still bubbled over. I’m guessing it’s due to the fact that the cranberries gave off more liquid than I expected ( I adjusted the recipe to reflect this). Luckily I put my pie on a sheet pan incase this would happen, also, its easier to take out of the oven for me. Peel. core, and slice apples. 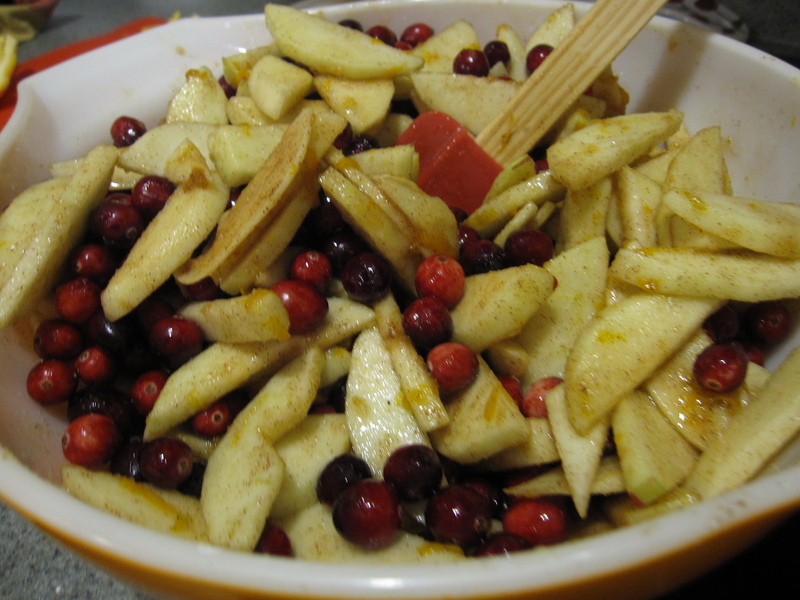 In a large bowl combine the apples, cranberries, and all other ingredients. Mix well. If there is a lot of liquid add a bit more cornstarch to thicken it. Put 1 crust into 9″ pie plate. 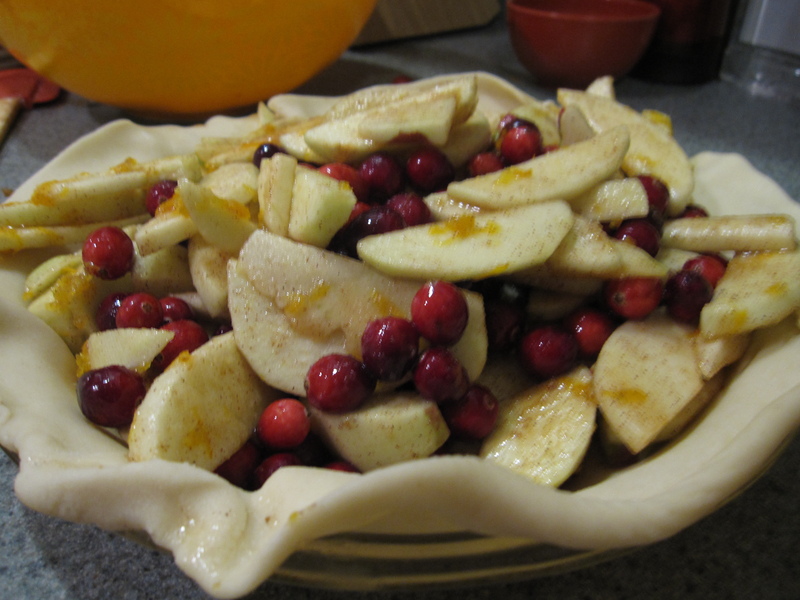 Carefully, add all apples and cranberries into pie crust. Cover with the other crust. Trim the edges/excess and cut slits in top crust. Bake for 15 minutes at 425. Turn oven down to 350 to continue baking, approx 45 minutes. If the crust starts to darken add tinfoil around crust or slip on a crust shield. Let pie cool 15 minutes before serving. The cooling allows for the juices to thicken. 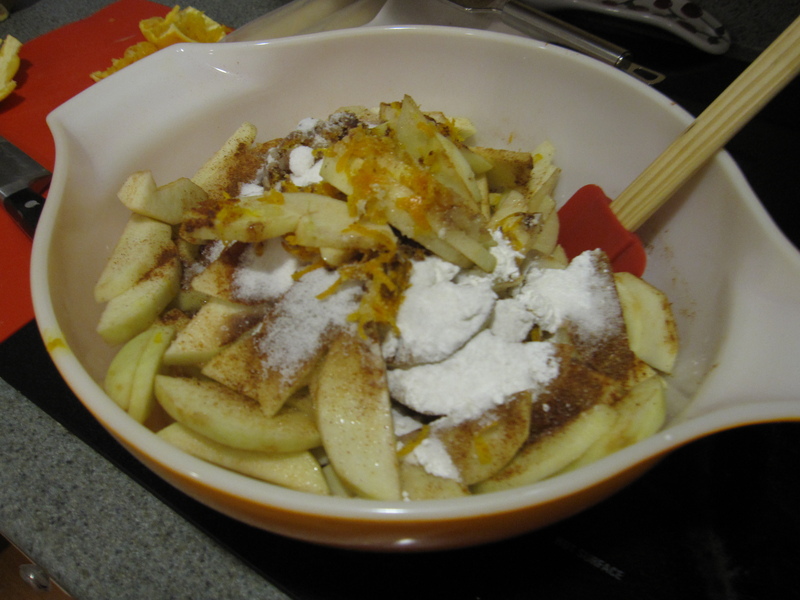 And remember… a compost would love all that apple peel and core goodness. At least my compost does! OMG this pie looks amazing!!! I think the ginger is a nice touch with the cranberries. How did you get your photos so big and your format so wide??? I think your calling is culinary training not architecture. You seem to really enjoy doing cooking and baking and you are good at it. Baking can be a struggle for some and yet it is a natural for you. Still time to reconsider your future.